« Are you ready for your Lean Journey? When was the last time you went to a meeting and walked out at the end and said “That was time well spent”? If you have a job, then odds are, you usually have the opposite opinion at the end of most meetings – you walk out thinking “that was a waste of my time”. I used to sit in some meetings and count the number of people, figure an average annual salary and then calculate how much money the company was wasting discussing whatever happened to be the topic. I was once in a meeting with 27 managers, averaging around £38,000 in annual salaries and we were discussing what we should do with the cleaning kit on the shop floor! You can imagine how happy I was to be there! It doesn’t have to be that way! Meetings, while technically Non Value Added (NVA) activities, can be an effective way of ensuring that progress is made, that people are on track and to provide support or at least the opportunity to ask for support. They can also be places to make decisions, assign responsibility for actions and to communicate important issues. 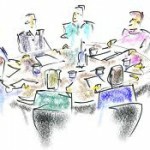 How do we ensure that our meetings are effective? The first thing to do is to ensure we are clear about the purpose of the meeting. A friend of mine once went to a meeting and began by asking the person who had called him to the meeting “what are we here for?” The response was to get agreement on the way forward for a specific project. Since my friend had already been briefed and was in agreement he replied – “Good – I agree, let’s get back to work!” By checking the purpose of the meeting first, he was able to save himself and his colleague an hour of DPP (Death by Power Point). There are other things we can do to ensure our meetings are as efficient and effective as possible; having an agenda that everyone has seen in advance allows people to come prepared. Sticking to time and ensuring any side discussions are held until after the meeting also helps. Even assigning someone the role of watching the time and keeping people on track can ensure the meeting doesn’t run long or off track. Meetings are almost an inevitable – like Death & Taxes – but they don’t have to be painful. With a little preparation and agreement of the purpose in advance, a meeting can be an effective tool for managing any business. If you would like to know more about how you can improve your meeting effectiveness, please contact us here. This entry was posted on Tuesday, February 1st, 2011 at 10:54	and is filed under Losses & Wastes. You can follow any responses to this entry through the RSS 2.0 feed. You can leave a response, or trackback from your own site.